Click on any picture to see pedigree. After viewing pedigree please use the "back" button to return to current page. Angus came to us from breeder Sherry Von Engel. He was the sweetest dog, he didn't have a mean bone in his body. 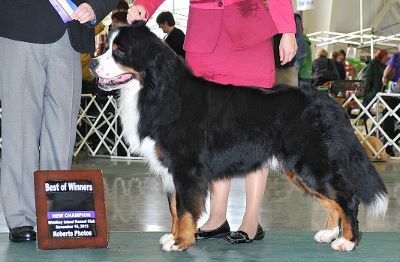 He had the biggest coat I have seen on a Bernese Mt. Dog. We collected him to use with a female later that we thought would work well with his strengths. We finally found Blue and we felt the two would work well together so we bred Blue to 10 year old frozen sperm and we got River. Please see her on our "My Girls" page. OFA Hips Good, Clear Elbows, Cerf. Hugo is from our first litter that Reese had. His Dad is Buzz, CH. Spellbound Infinity and Beyond. Rainy is his litter mate sister. We love Hugo's outgoing personality, to say the least. He is a great boy with bone, size, movement and a gorgeous head. He has nice dark eyes and a great bite. There is not one thing that we do not like about him. 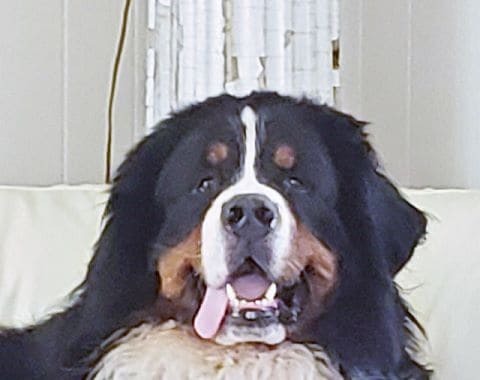 He is young and a real goofball but we love him. He is now 7 years old. We are very excited about this boy. XO was a stud fee puppy from Teresa Dickerson. He is a nice big teddy bear. He is an Angus son and his mother is a Lorna Felice girl. His grandfather became a champion at the rip old age of 10 years old. He has a wonderful sweet temperament, just like his Dad, Angus. His movement is impeccable he just floats when he moves. We are so very excited, on the weekend of his 7th birthday he got both of his majors! We couldn't be more thrilled! XO is now 9 1/2 years! Longevity is very much cemented in his lines. Even though Lorna is no longer with us, I want to thank her for the vision she had for longevity. Paired with her careful selection for long life, with the longevity WINK Kennel has we are proving that breeding for longevity does work. We are so proud of him. He still moves like a dream. Roman is 5 years old. He is a real character. He is the last puppy from Reese. We decided to repeat the breeding between our Reese and Dillon, Anne Summer's boy. We love him. 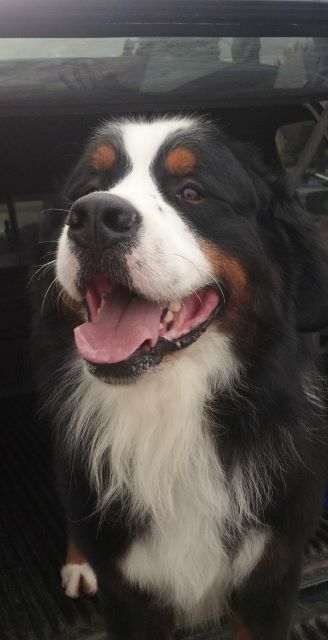 He is way over 100 pounds probably about 120. He has a sweet, sweet temperament just like Reese. He is very laid back, nothing seems to bother him. He loves everyone. He has a big head and tons of bone. Urban is a real dream! He is three years old, he is awesome. He has a huge coat and a beautiful head. 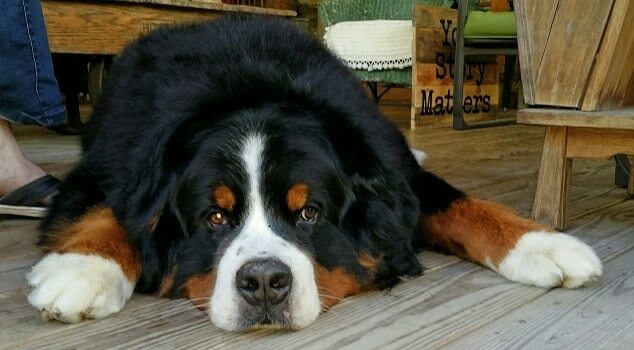 He weighs over 100 pounds. I think he is going to be a big boy. This dog has potential, potential, potential. I am super excited to see this boy start his show career . He is from my Rainy and my XO. This litter I wanted to keep a boy and I think he is it! We just did a couple of shows with him and he is starting to understand that dog show are fun because you get chicken! What a special treat! !